You have hundreds or thousands of products in your store and you are worried about spending much time on changing prices of them. 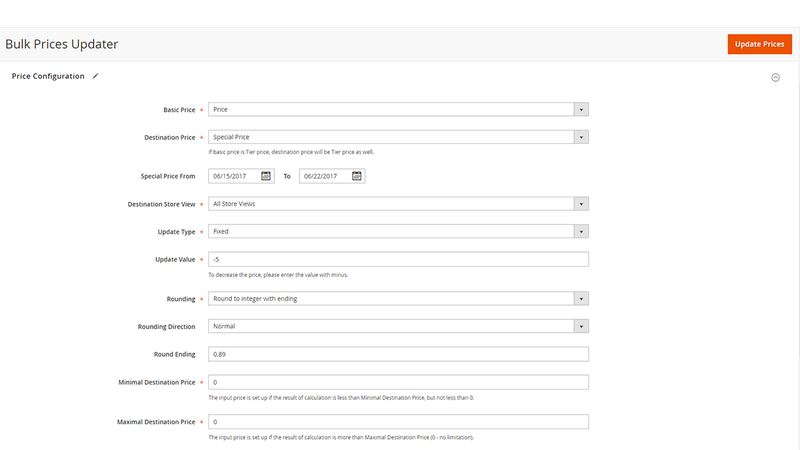 We would like you to offer our module Bulk Prices Updater for Magento 2 that will help you to update the prices of thousands of products just by few clicks. You just need to select the products which needed to be changed. 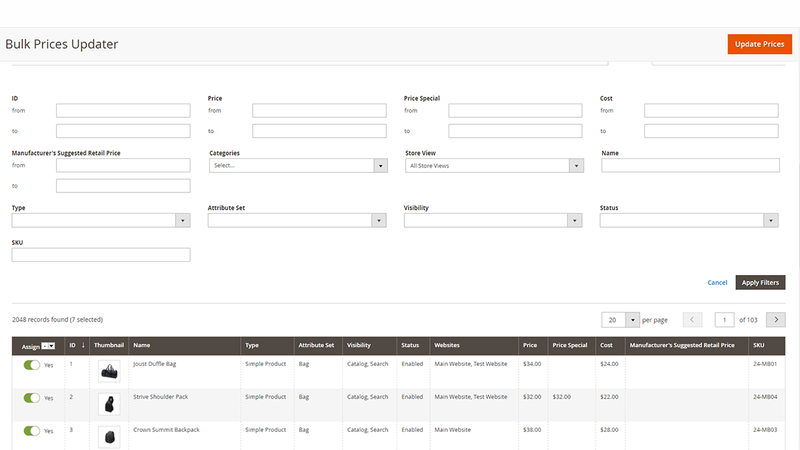 Enhance the native Magento® functionality with our extension's functionality. The prices of the existing products in the store can be increased as well as decreased by administrator needs. Various reasons can cause the changing of product prices. It can be an increase in manufacturing cost of the product or decreased for products from specific category because of a promotional event. 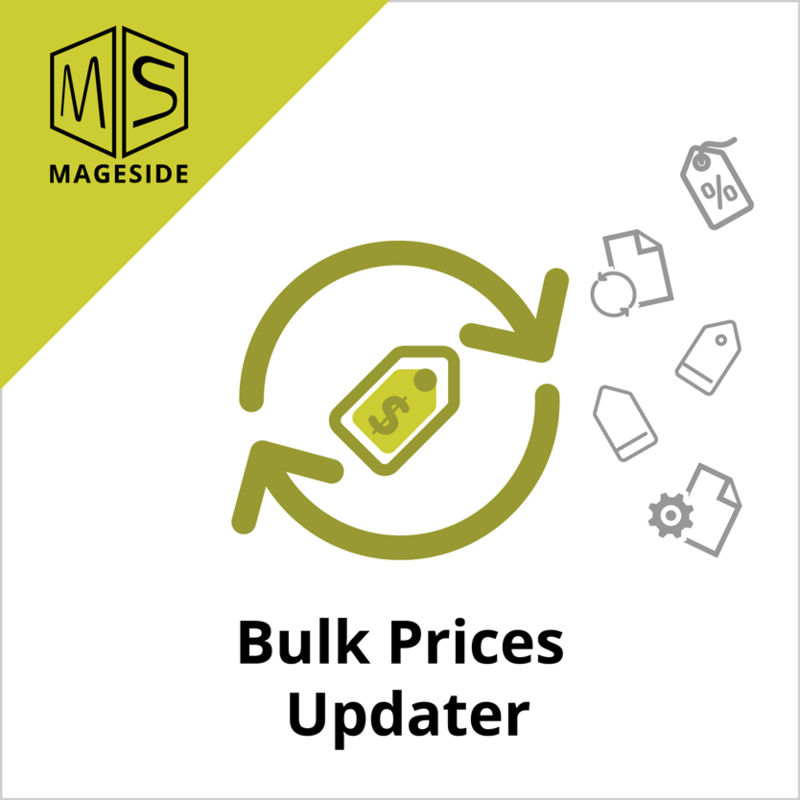 Our module Bulk Prices Updater can help you update prices of products in time without any loss for your store. 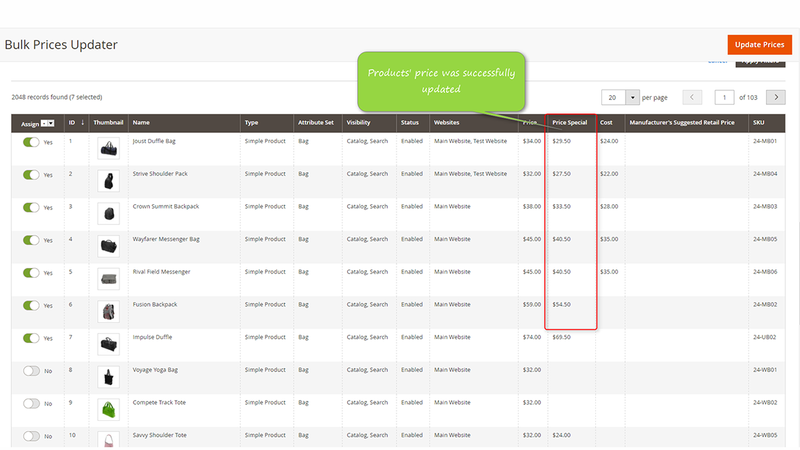 Bulk Prices Updater allows you to apply percentage or fixed amount changes to product prices. Another pleasant option of this extension is that the price of your products can be rounded. 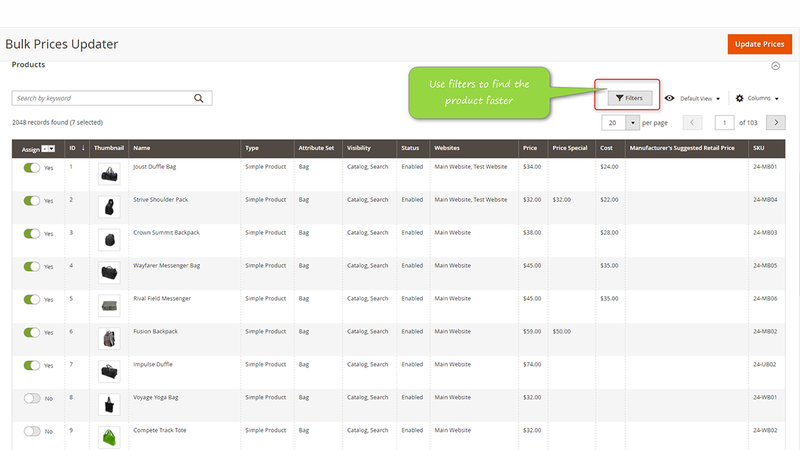 Use this option and be sure that your pricelist always looks just right! 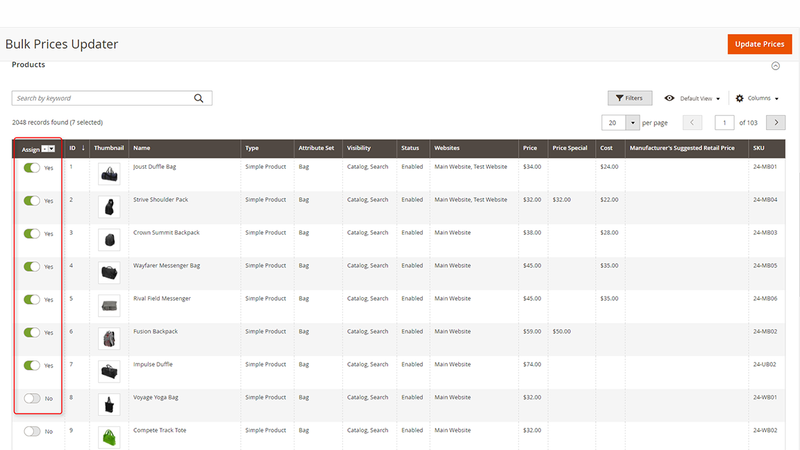 Use our new feature and filter products by categories. Using this extension you don’t need anymore to spend so much time updating the prices. 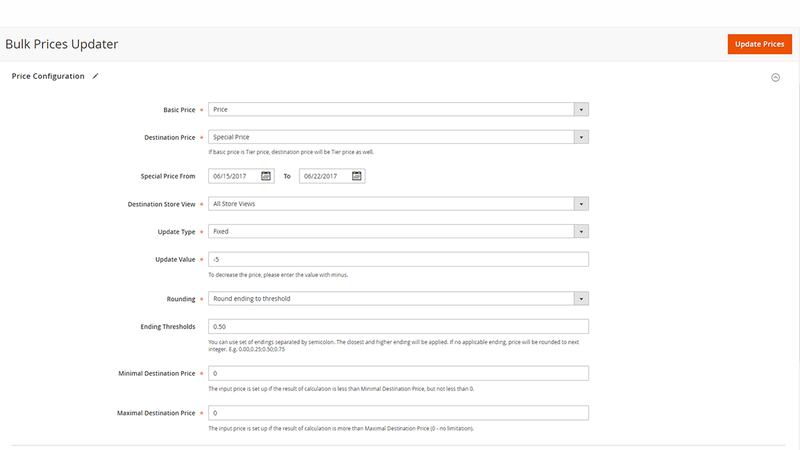 Now all you should do is select the products needed to be updated, fill up all necessary setting fields and press the button “Update Process”. That’s all. Now such routine work can be done in a few minutes. If you want to decrease the price you just need to enter the value with minus. In configuration settings you can select the type of updated products. You know that sometimes the prices can look odd in your store. For example, the product should be rounded with ending: 0.34, 0.78 etc. With this extension you should just type the ending of the rounded prices. 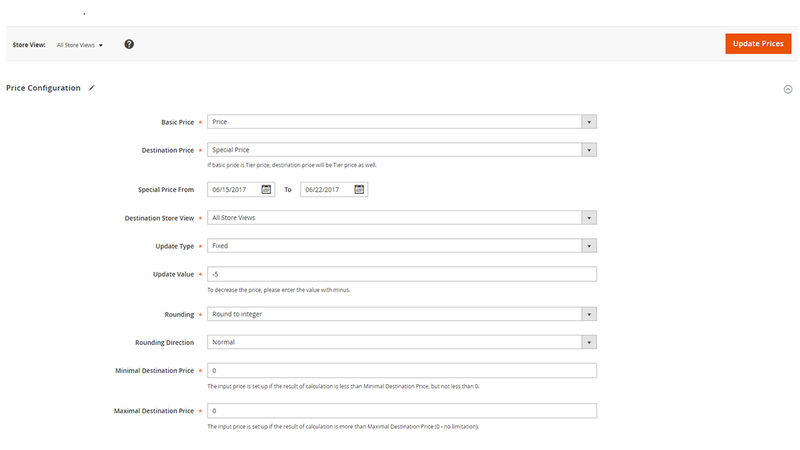 If you don't want to spend hours updating the prices of the products, install the extension Bulk Prices Updater and make all necessary updates by few clicks. I found a bug in the extension and a couple hours later they've fixed it and released a new version. Great work. Very happy with this extension and service. Well designed and easy to use. A must have for our business. I bought this on Magento connect and the support team at Mageside have been so patient and supportive of me a newby to Magento 2. I would highly recommend them and this extension, which does exactly what it says and more. It is well thought out and takes the tedious task of manually updating pricing and includes rounding. I would buy from them again without a doubt.